The small schools movement is building momentum throughout the country. Students receive a personalized education and take advantage of a variety of unique opportunities. 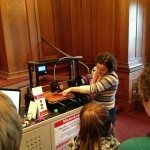 James Blackstone Memorial Library made available its Maker Lab for just such an opportunity. 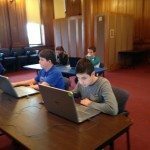 Two small schools, CT Experiential Learning Center (CELC) Middle School of Branford and FlexSchool of Fanwood, New Jersey, have joined forces. The students began in September with correspondence through the old-fashioned method of letter writing. Then, Tuesday, 12 January, the groups came together and met for the first time. 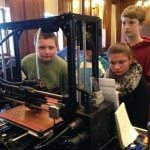 They greeted one another, sat down for lunch, and then took part in a Maker Lab to explore 3D-printer technology. 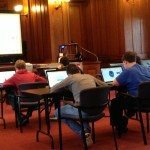 Students were fascinated, as program director Katy Dillman demonstrated the process of creating a design using Tinkercad software. Each student also had a chance to work on a computer to create designs to be printed. A great first meeting followed by a special treat of Ashley’s Ice Cream! The next collaborative adventure between CELC and Flex will be a visit to the Metropolitan Museum of Art in New York City, where museum curator Sean Hemingway will give the group a private tour. Small schools certainly do make learning meaningful and fun, and it is all part of the regular day! ~Click on any image to view a scrollable gallery. 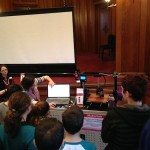 James Blackstone Memorial Library provides free access to the tools and technology in The Maker Lab. Contact Katy Dillman at kdillman@blackstonelibrary.org. To find out more about experientially-based education, contact CT Experiential Learning Center (CELC) Middle School at mandm@CTExperiential.org. Visit online www.CTExperiential.org.